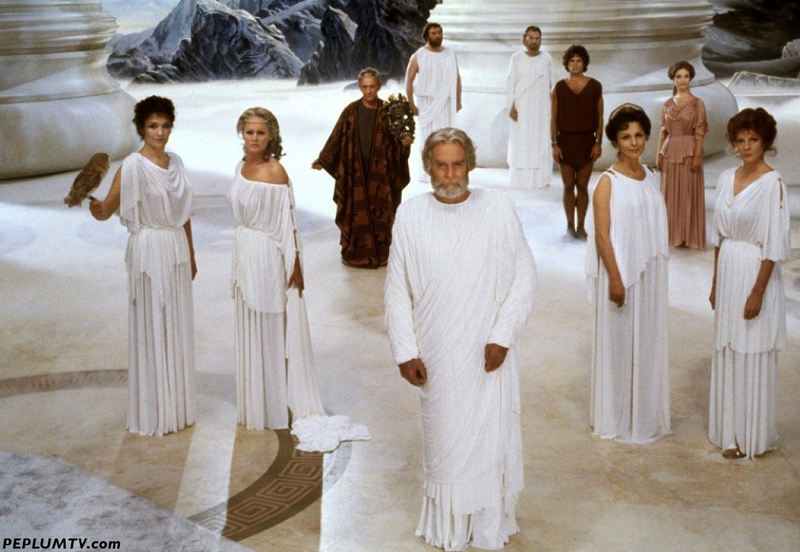 Athena (Susan Fleetwood), Aphrodite (Ursula Andress), Burgess Meredith (Ammon), Hephaestus (Pat Roach), Laurence Olivier (Zeus), Jack Gwillin (Poseidon), Perseus (Harry Hamlin), Hera (Claire Bloom), Andromeda (Judi Bowker) and Thetis (Maggie Smith). Great cast. Unfortunately, most of the Gods had very little to do. Their roles were more cameos than anything else. It's always odd seeing a photo of characters that were never together in the story, that is Hamlin, Bowker and Meredith with the Gods. Hamlin and Andress became a couple after making this film and had a son together. Excluding mythical creatures, such as the Medusa, there are many characters missing in that cast photo including Calibos, Thallo, Cassiopeia (played by Sian Phillips, above), the Stygian witches and of course, Bubo. 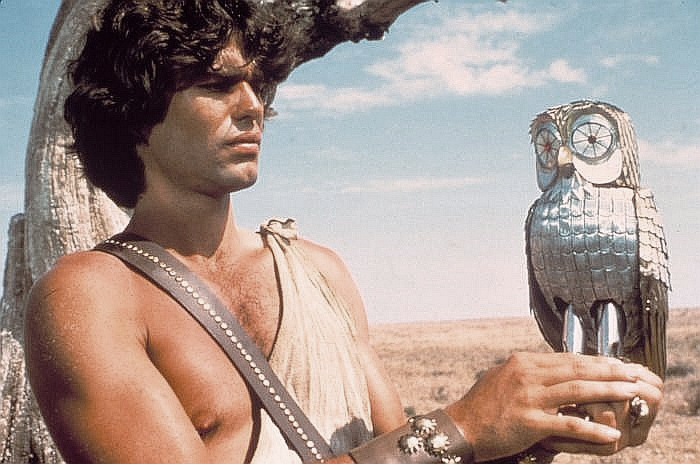 Athena's owl would become Bubo, one of the most polarizing characters of all time. Part stop-motion and part animatronic (depending on the scenes). Personally, Bubo didn't bother me but many absolutely loathed the cute mechanical owl. 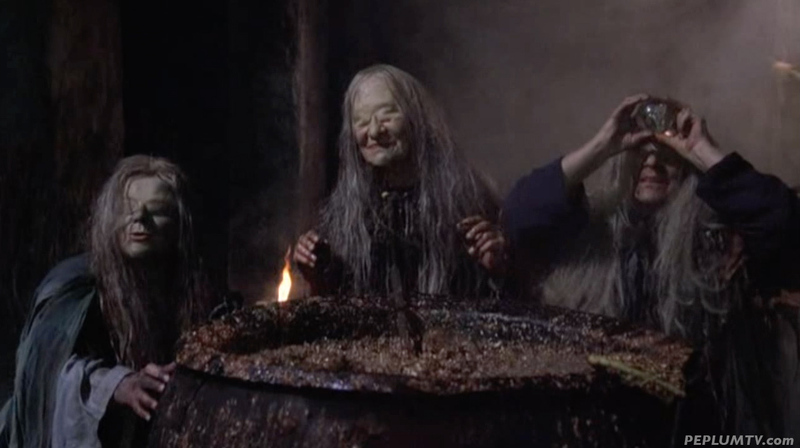 Flora Robson (don't ask me who of the three she was) is one of the Stygian Witches. Great scene. I actually enjoyed the mechanical owl. The movie, however, was somewhat of a disappointment in my view. The scenes of the gods slowed the action. This was my first Harryhausen movie, and to say it made a HUGE impression on me is an understatement. I was a big dinosaur and monster buff, and I got my mind blown by the original King Kong when I was about five. Some years later this movie came along. I was by then fiercely hunting down all movies with stop-motion effects, and I really got my fill with Clash of the Titans. Since I had also become a little mythology scholar I was delighted to see, not the usual dinosaurs wheeled out again, but the actual monsters of Greek myth. King Kong and Clash of the Titans are the reasons behind my own stop-motion passion, and why I still keep making my own stop-mo mini epics with my friends. This movie was partially shot in Malta. The scene where Pegasus flies over a gigantic arch was shot on the sister island of Gozo. Pity that arch has surrendered to the stormy seas. It's no more. 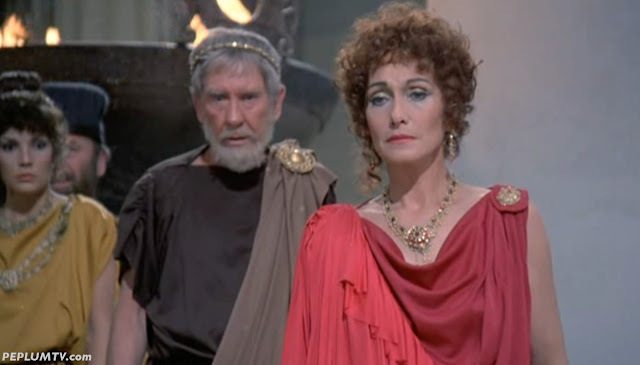 Cool trivia: Jack Gwillin is also in "Jason and the Argonauts" as the king of Colchis. But I do agree that as awesome as that film is, it does feel a bit of a waste to have such big stars playing the gods and goddesses and barely do more than stand around in Olympus.